Browse Shop for more articles like this. 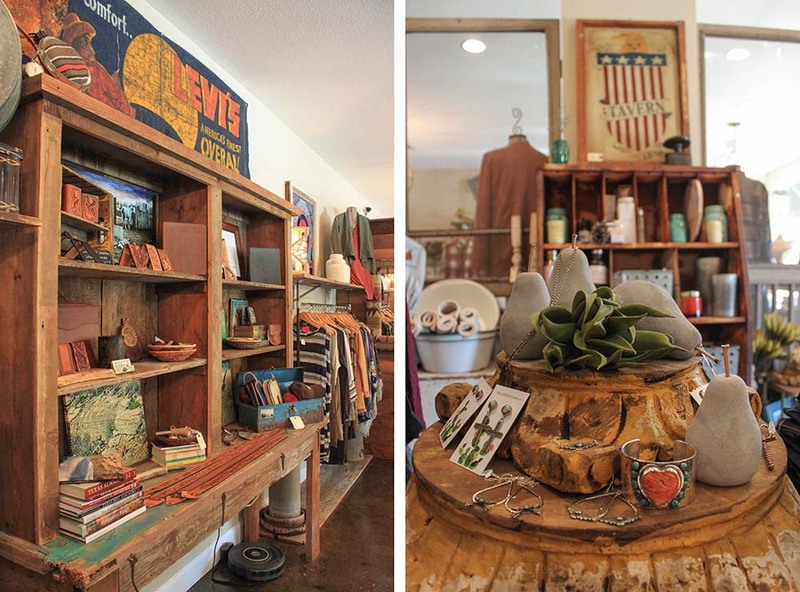 In the heart of Johnson City is Stidham Outfitters and Custom Leather, a store ingrained in Western heritage. 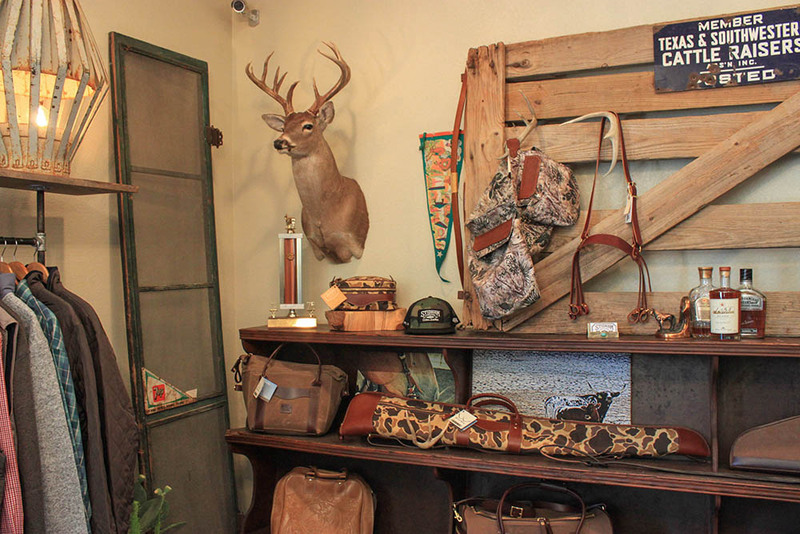 Stidham Outfitters pays homage to the Hill Country lifestyle by featuring handmade leather goods, rustic-yet-contemporary apparel, and charming homewares. 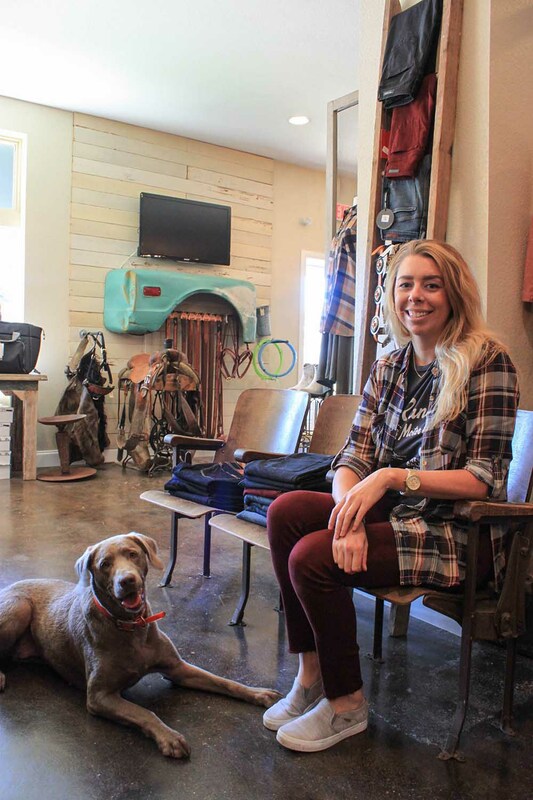 Seth Stidham, leatherworker and real-life cowboy, opened Stidham Outfitters with his partner-in-crime, Jasmin Arpin. 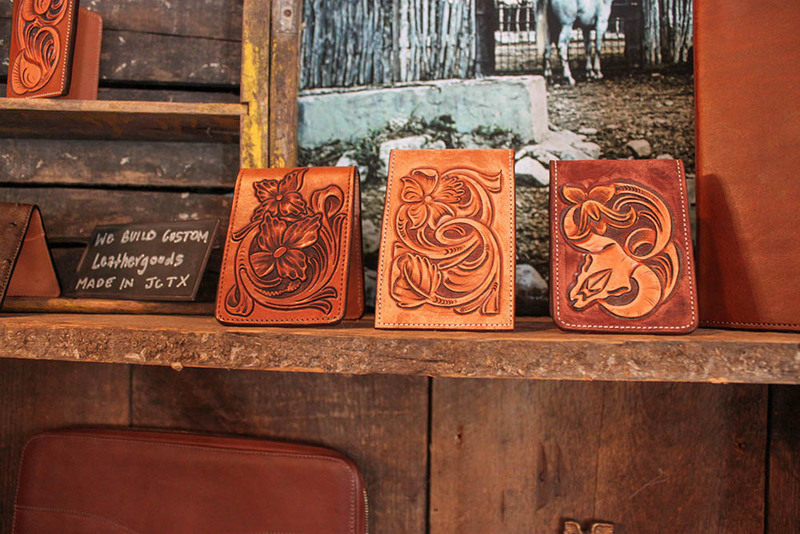 Stidham got his start tooling leather when he had the opportunity to work for a saddle maker in Salado. After the saddle maker sold his company, Stidham stuck with the craft, which had become his passion. Stidham draws each of his designs by hand and regularly retires designs from his work. For custom designs, he’ll add initials or a logo but not much more than that. Once Stidham gets to work on a project, he turns into a machine. With his cowboy hat pulled down and a toothpick between his teeth, all concept of time is lost until he is satisfied with his progress for the day. 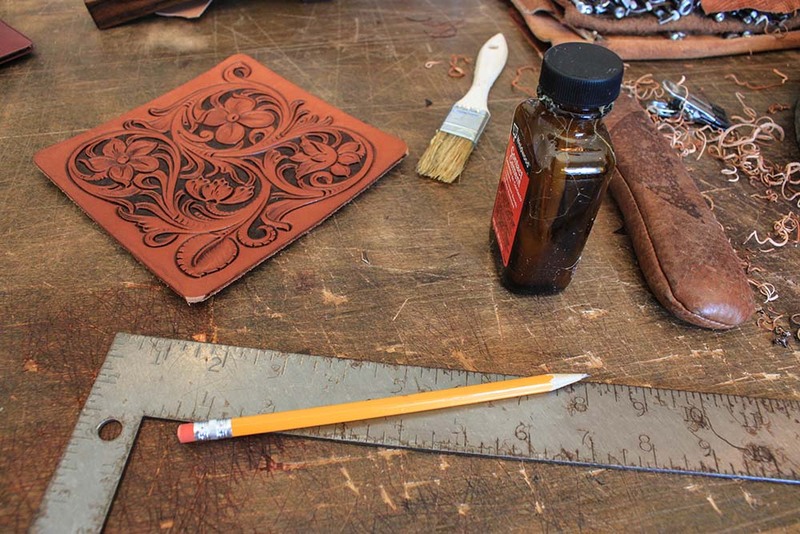 The leather working process for an item such as a belt can take a full day of work, from drawing the design, carving it out, tooling, edging, and sewing. Stidham works in batches, though, so it is rare any one project is finished in a day. For custom orders, he asks for a four-to-six-week turnaround time. Stidham excels at his art and craft. He can make nearly anything out of any type of leather: knife scabbards, wallets, belts, purses, pillows, rifle slings, gun holsters, catch-all trays, and so much more. While he typically works with leather supplied out of St. Louis, customers often bring in exotic hides such as ostrich, buffalo, hippo, and gator. Stidham’s workshop has a hectic organization — the kind of system in which creative types thrive and foster. 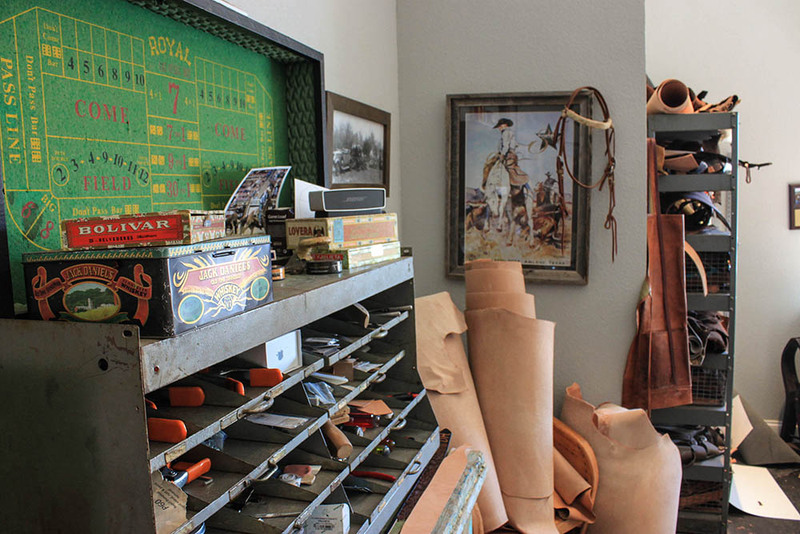 In there, you’ll find remnants of his past running rodeos, various lengths and scraps of leather, a craps board, at least four sewing machines, and every tool of which a craftsman can dream. While he works, he listens to a playlist that he describes as Western Americana: Ryan Bingham and Jamey Johnson with a bit of ZZ Top mixed in. Arpin, meanwhile, represents the retail side of business. She handles the books, crunches the numbers, and does all the merchandising. She also does the purchasing for the clothes, shoes, accessories, home goods, and other items in the shop. She values quality more than anything and places a sharp focus on American-made items. She generally stays away from wholesale markets, where retailers can buy bulk, imported goods. 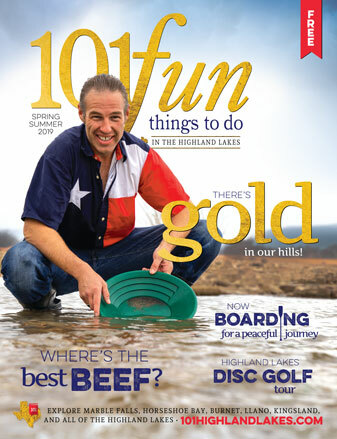 Stidham Outfitters is very much lifestyle-based: It offers goods that fare well in the Hill Country. Here, you’ll find what you would wear to a wine-tasting one weekend and to the LBJ barbecue at the Texas White House the next. The couple moved to Johnson City in 2011. They originally hail from the Georgetown area. Growing up, it was still a rural, charming farming community. Today, it’s more like a suburb of Austin. Before they moved away, a shopping center with big-box retailers came to town, causing vacancies and turnovers in Georgetown’s historic square. The couple was looking for a change, and Arpin’s work with a real estate developer brought them to Johnson City. The Johnson City community is important to Arpin and Stidham. They sponsor a little league team and donate to the volunteer fire department fish fry, the wild game dinner, the livestock show, and the Lions Club. Stidham Outfitters and Custom Leather is located at 201 E. Main St. in Johnson City. The store is open 10 a.m.-6 p.m. Monday-Saturday and 11 a.m.-4 p.m. Sunday. Call (830) 225-8181 or visit stidhamoutfitters.com for more information.